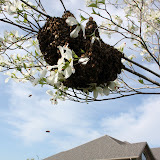 Just getting off work today, and got a call about a swarm in Ozark. So I called my wife and gave her the good news. I suggested that the whole family go and I rushed home, loaded up the bee equipment and all the girls. The girls were so excited to go and do a swarm removal. We got to Ozark just as the sun was beginning to go down and everyone was hungry. So a quick stop at the local Wendy's to get everyone some fuel and we were off to catch our swarm. It seemed like we drove all over Christian County to get to the swarm. We pulled in the driveway and were greeted by the nicest family. It felt a bit like the fireman pulling up to the fire. Well, there they were just as described, a volleyball size swarm about 8 feet off the ground. It was the family's first time to see a bee swarm up close, so I wasted no opportunity to show my beekeeping skills by sticking my fingers right into the swarm. They of course were so impressed. :) Yeah, right. I think that my wife said something like, "stop messing arround before you get stung." So, off to work I went. After several attempts to get the bee box up next to the swarm, I finally decided that I was going to have to hold it myself. I climbed up the ladder and just held the box up into the swarm until my arms felt like they were going to fall off. When I pulled the box down there were plenty of bees that had decided that the box was a suitable home and had already gone down inside. I didn't want to miss the opportunity to show the girls, so I pulled the box all the way down to the ground. Everyone was so amazed to see the the bees with their tails up in the air fanning their nasonov gland. This is the bees way to "call" the others to come and investigate the new home. Nasonov is a pheromone that the bees use to orient forager bees back to the hive entrance. 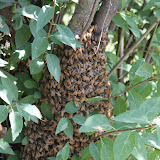 In a swarm situation they use the pheromone to attract the other bees into the new hive. After several more "lifts" of the hive up to get more bees in, I decided it was time to hurry up the process and began brushing bees into the box. This worked very well with the exception of having them flying into my face, making it difficult to stay close to the task at hand. I put my bee veil on to make the job a bit less uncomfortable. Tracy even got into helping me brush the bees into the hive. It was a very fun family experience and I hope the young girls remember it for years. Darkness was approaching, so I finished up brushing them and set the hive box on top of the ladder to hopefully collect the stubborn ladies that just would not come off the branch. It took about another fifteen minutes before they finally realized that their sisters had left and where they went. Once all the bees were safely in, I put the lid on, strapped it all together and loaded them in the car. It was a fun evening, and I think all the kids really liked watching me catch a swarm of bees. I am going to have to take them out in the bee yard from time to time to show them the swarm that they caught and how they are doing.